For the most of MUTEK, even people with a full pass had to fork over cash just to get into the Satosphere, upstairs at the SAT. But for Acid Pauli's set, where he spun a weird brand of nomad techno, the fest allowed patrons to go upstairs without paying extra — and what an amazing space it was. The DJ booth was basically dead centre in a giant planetarium, the visuals completely surrounding your field of vision for a truly mesmerizing experience. We really need to give a shout out to the visual artists Diagraf, LLL & Felix Felix Gourd Gourd for their amazing contribution to the night. Hypnotic wormholes of squares vibrated into oblivion, vast cathedrals formed and disintegrated, and amoebas quivered under the Aurora Borealis. While we're at it, in fact, some recognition needs to be given to all visual artists throughout the festival, as everything was simply beautiful to look at. Once you remembered to take your eyes off the light show, and properly focus on the music, you got to hear the soft vocals over equally soft ambient techno that Acid Pauli was playing. We may have been in the dark, but his DJ set was still the sunniest thing for miles. He somehow managed to drop the lyrics from "Sultans of Swing" by Dire Straits over Syne's "Kant" and make it work. That wasn't the only odd combination, either — he also made Leonard Cohen run into "11th Hour" by Karmon. Then to top it all off he donned his cowboy hat before the beat kicked in on his closing track, Emilie Nana's "I Rise." Acid Pauli's serene closing set for MUTEK gave us time to reflect on the true scope of the festival for the past few days. It wasn't just a fine display of some of the most creative and forward-thinking artists in electronic music — it was so much more than that. There were talks on during the day time, that focused heavily on empowering women-identifying folks in the scene through the Keychange: Symposium, as well as ones that tackled diversity, industry issues and the politics of dancing, to name a few. 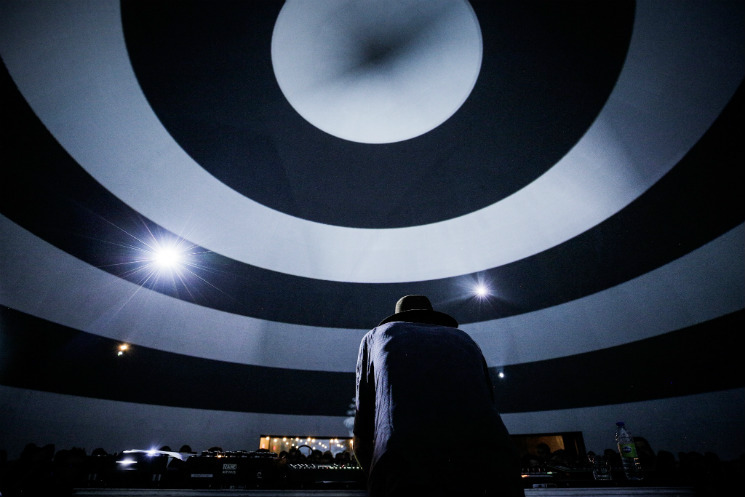 MUTEK felt like a weeklong conversation this time around. The festival actually achieved gender balance for the first time. This year, MUTEK also had 20 Canadian, 18 North American, and 16 world premieres, reaching a staggering total of 52 never-before-seen performances. With two free outdoor stages too, it was really the heart of the city all week, and boy did it have heart.